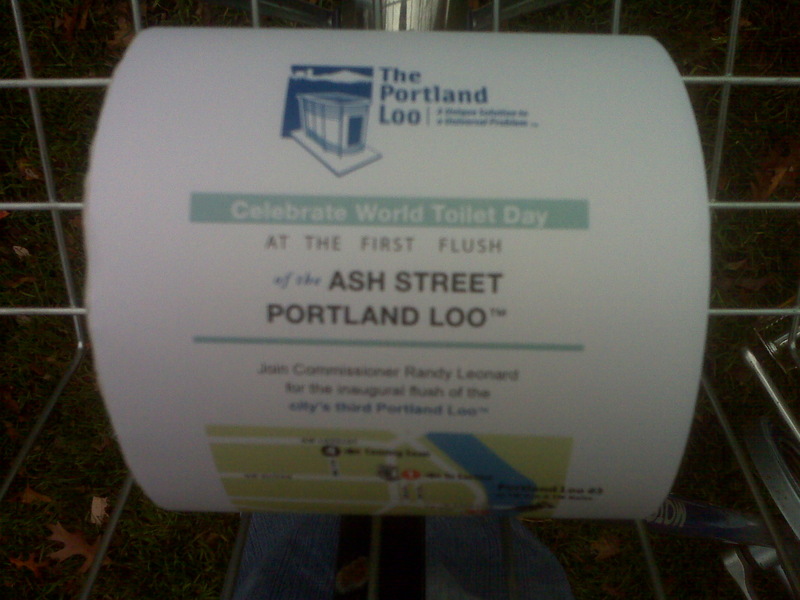 When I heard that they would be opening a new Portland Loo on World Toilet Day, I knew that I would have to go, but I also didn’t want to get my hopes up that I would be the first person to officially pee in it. I’m sure construction workers or plumbers installing the Loo used it, and who knows if it was locked before the ceremony. 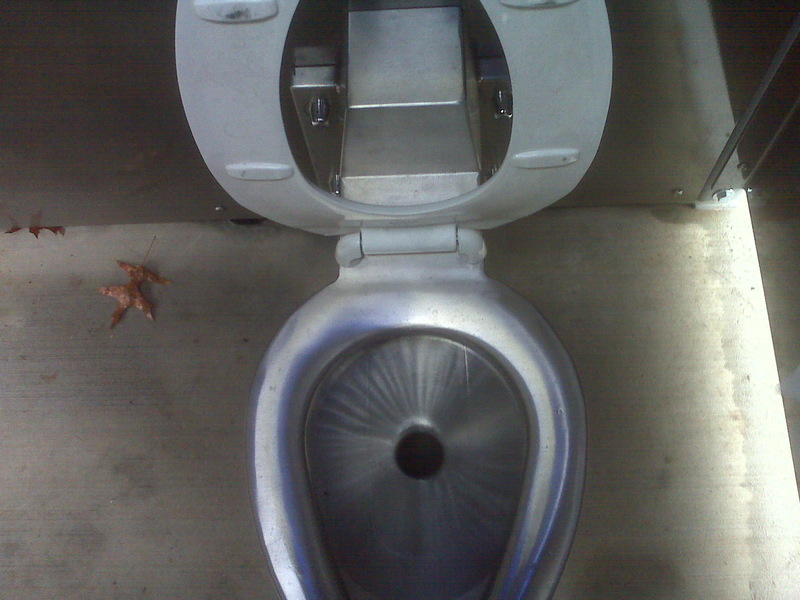 But what if I could be the FIRST person to pee in the new Loo after the ceremonial first flush? A boy can dream. Even if I couldn’t be the first, it seemed like an appropriate way to celebrate World Toilet Day, which is actually a pretty serious cause for an event with “toilet” in the title. 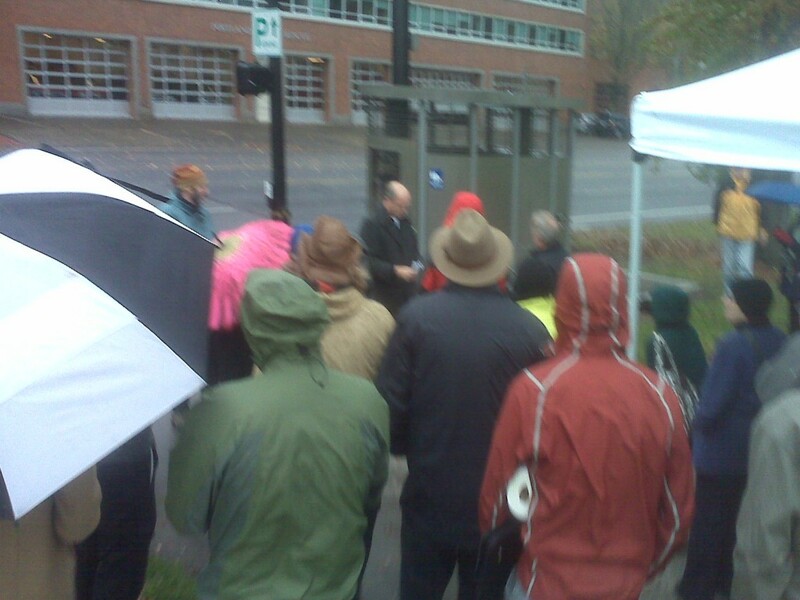 I biked down to SW Naito and Ash and was surprised to see a pretty good sized gathering, considering it was cold and rainy and was a celebration of a public toilet. But this is Portland. While I was waiting for the event, someone gave me FREE TOILET PAPER! I’ll probably never use this unless there’s a really big post-apocalyptic disaster and I simply can’t go to Costco for the 115 roll pack. 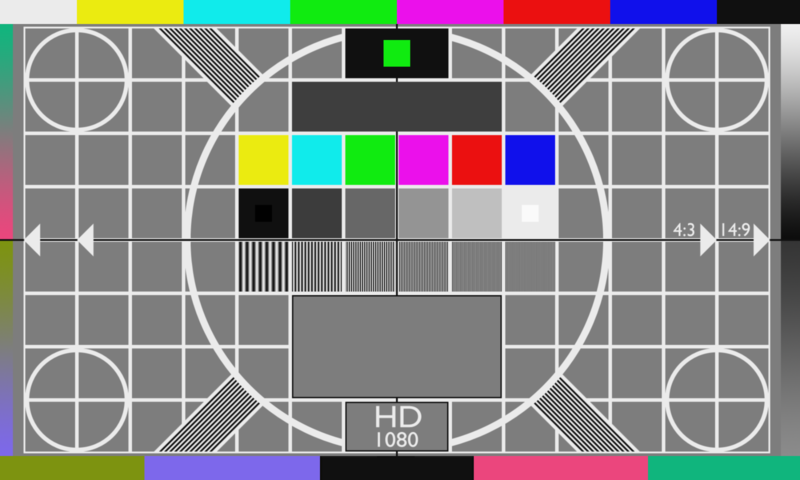 I thought there would be a mad dash for the Loo after that. 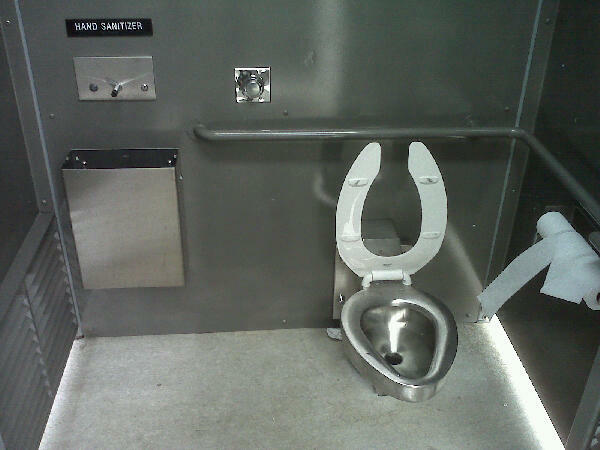 Not that everyone had to go, but who WOULDN’T want to be the first to use it? There were about 5-10 people blocking my path to the loo AND I was pushing my bike. One guy went in, but his sneakers never moved past the doorway. Stage fright. I was getting ready to make my move, but then Commissioner Leonard slowly edged his way inside. Maybe just to take a peek? The door closed. Okay, fine, I could be second after the guy who worked to get the toilets placed around the city. But–and I expect a wild debate about this–I never heard him flush. Not that he forgot to flush, but that he never went. The door opened and a nice woman, who I later found out is named Anna, said she wanted to get a picture of me bringing my bike inside if I intended to go in. There was a guy opening the door and I started to move my bike in, as if he were holding the door for me (the doors are pretty big). 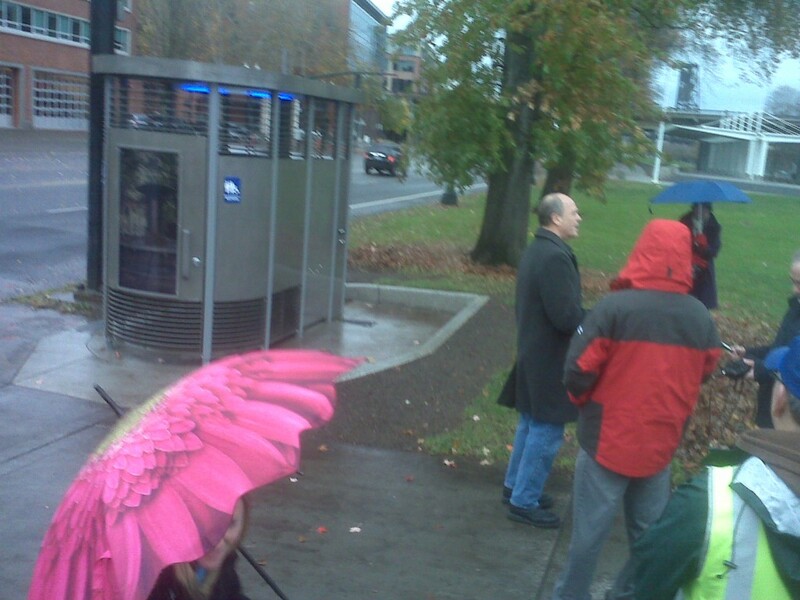 I locked the door behind me, flipped up the toilet seat and this is what it looks like when you’re the first person to pee in a Portland Loo after the ceremonial first flush! When I flushed, the crowd outside cheered. CHEERED! It was awesome. Then I slowly opened the door and pushed my bike out. 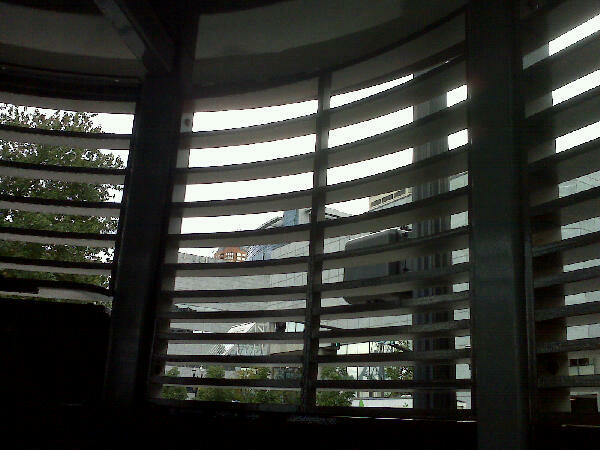 There was a small crowd of people watching me. I said something too quietly about not putting the seat down. After the event, I was able to get in touch with Anna, who directed me to the Portland Loo Facebook page where there ARE PICTURES OF ME! 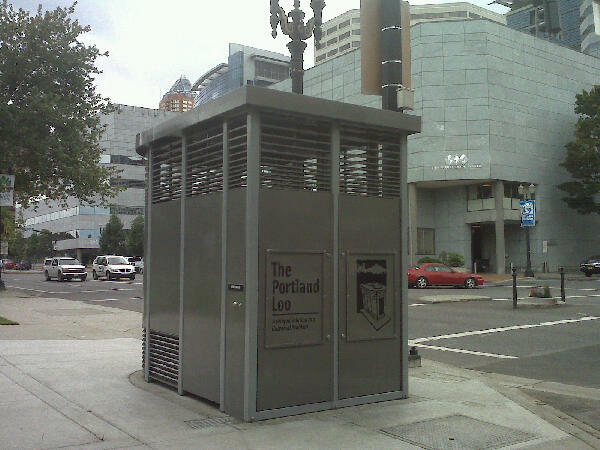 After that, I rode off thinking about the controversial Portland Loo opening in the Pearl. I don’t know when it’s opening, but I’ll be there with a full bladder. 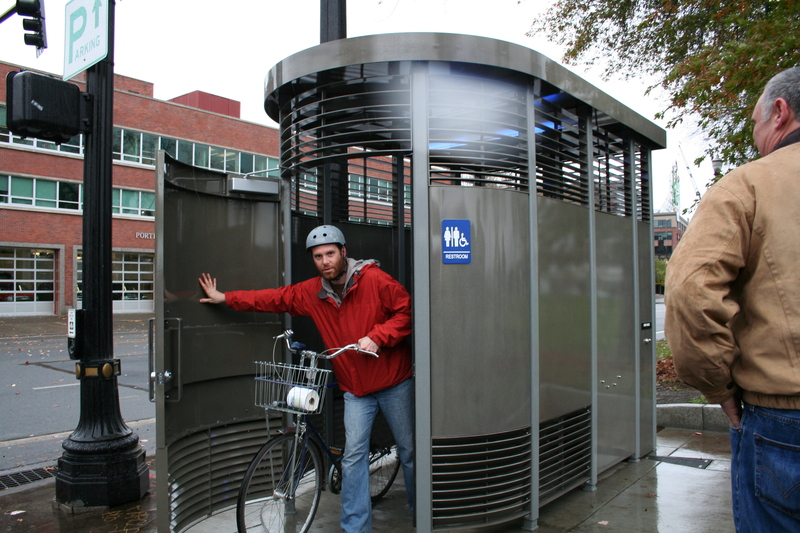 And if there’s ever a Loo that opens in Sellwood/Westmoreland, let me just say I know someone who would like to nominate himself for the ceremonial first flush.